Scroll down this page to read about each part of the Pitti Palace buildings. Luca Pitti, a rich banker, had this regal palace built and lived there with his family from 1470 onwards. The building was meant to look glorious from the start because the Pitti family were in competition with the powerful Medici and wanted their new home to be even more imposing than the Medici family palace. The Pitti Palace is set far back from the pavement and has an enormous open square in front which makes it all the more noticeable and impressive. The Pitti fortunes didn’t last though, and, in a twist of fate, they ended up selling the palace to the very rivals they were competing against. Eleonora di Toledo, the wife of Cosimo I de’ Medici, Grand Duke of Tuscany, bought the building in 1550. Under the Medici the Pitti Palace was enlarged to nearly twice its size. It became the most majestic palace in Florence, and still provokes that awe-inspiring feeling today when you cross the Ponte Vecchio and see the Pitti Palace on your left. The Palace was lived in by the Grand Dukes of Tuscany and was used by Napoleon when he was in Florence during his reign over Italy. Pitti was also the home of King Vittorio Emanuelle II from 1865 – 1871 when Florence was the capital of Italy. Leopold II, one of the last Grand Dukes of Tuscany, opened the Pitti Palace as a museum in 1833. All of the valuable collectibles that the past owners had accumulated as well as the interior design of the rooms themselves became part of the museums which make up the building today. A ticket to the Palatine Gallery also gets you into the Museum of Modern Art and the Royal Apartments. The Galleria Palatina is really a two-fold museum: The building itself and the art works it contains. The past rulers of Florence used to live in the Pitti Palace and this can be seen in the ornate and sumptuous interior of the home, the elaborately frescoed ceilings, the fancy stucco work on the walls and trimmings, and the general splendor, pomp and opulence of everything in the building. 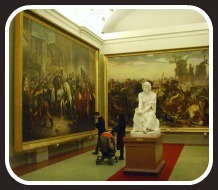 Then, there are the more than 500 works of art that make up the Palatine Gallery. These are mostly Renaissance paintings but also sculptures, and Florentine mosaic pieces. Like so many of the objects on display in the Pitti Palace, many pieces in this gallery come from the private art collections of the former owners of the building (the Medici and their successors). 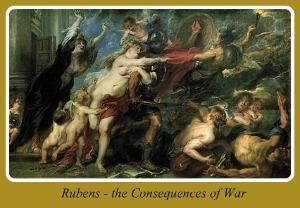 For example, the Rubens painting below was painted for Ferdinando II de Medici and is one of the masterpieces on display. The paintings are arranged in the gallery as if they were still in a private collection, as opposed to being organized as a museum display. The idea is to present and hang the works similarly to how they would have been set up when the Grand Dukes were living in the Pitti Palace. As a consequence, the pieces don't follow any chronological sequence and are not set up according to any painting style or period. Although this way of showing the paintings works (you do get the feeling that you’re walking through a regal home decorated with countless paintings) it has pros and cons. A good thing is that paintings aren’t roped off and kept at a distance so you can get up very close and appreciate the details of each piece (I'd never got so close to a Velazquez or Raffaello before). On the con side, you might feel confused since there's so much to see and no logical order or guidelines to viewing it all. Most paintings are of the Florentine school and the Baroque period dating from the 16th to 17th centuries. You can see works by Raffaello (see Madonna con Seggiola, left), Tintoretto, Caravaggio, Botticelli, the Medici portrait painter Bronzino, Titian, Ghirlandaio, and many others. There are also magnificent pieces by foreign greats such as the Spanish genius Velazquez, and the Flemish masters Rubens and Van Dyck. A lot of the paintings have a religious theme whereas others are portraits of the Medici and other significant Florentine personalities. Still other works depict Greek or Roman mythology or real-life battles. 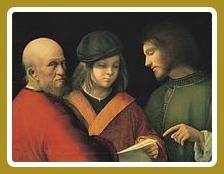 Others simply represent life, such as Giorgione's 'Three Ages of Man' (right). Undoubtedly the caliber of the painters that can be found at the Palatine Gallery and the wealth of art on display is impressive. The sheer number of paintings makes your head spin and might even lead to a feeling of overload. The walls are so full (paintings are lined up so high, they almost reach the ceiling) that you have to keep looking high up to see the art work. This can be hard on the neck! Each room has a handy card giving information about the works in the room. This can really help you to appreciate the art work even more. If you're the kind of person who wants to know about each piece in depth, be warned, this could literally take you all day. The rooms of the gallery lead into the Pitti Palace Royal Apartments where the Grand Dukes of Tuscany lived and, later, the King of Italy. Where the Palatine Gallery ends, the Royal Apartments begin. This part of the Pitti Palace could really be called a continuation of the Royal Apartments since all the rooms in the Galleria Palatina were also decorated for and used by the Grand Dukes and, later, the King. The royal apartments have been influenced by three historical periods of the Pitti Palace: the Medici period(about 1550 – early 1700's), the Lorraine period (early 1700's to mid-1800's) and the Savoy period (1860 –1920). The left wing of the Pitti Palace (where the Palatine Gallery is) was used by the Grand Duke, whereas the right wing (where these royal rooms are found) was where his son, the prince, lived. Not as grand-looking (or as big) as the Palatine Gallery rooms, this part of the Pitti Palace shows the smaller more intimate rooms – which nevertheless are quite lavish and extravagant. 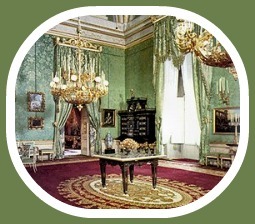 The royal bedrooms and related ‘private’ rooms are on display in this part of the palace. The smaller-scale rooms together with the plush opulent décor are somehow easier to appreciate here than in the vast rooms of the Palatine Gallery. The rooms tend to follow a color-scheme. There's the green room, the blue room, and so on. This is a nice effect - for each color there's a varied palette of tones, all finished off in delicate gold trimming. 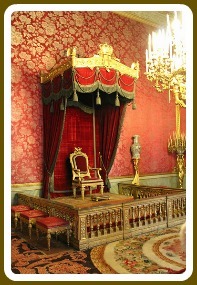 One noteworthy room is the Throne Room (right) with its plush deep burgundy velvet and ornate gilded trimmings designed for King Vittorio Emanuele II. The king lived here for the brief time that Florence was the capital of Italy (1865 – 1871) and the Pitti Palace was truly a 'royal' residence. One of the prettiest rooms is the Queen’s Commode (Toilette della Regina) with its pastel colored silk decor in rococo style. This oval-shaped room was decorated under the Lorraine period. You can also see lots of beautiful period furnishings such as four-poster beds, carved wood tables, and a 17th century ebony cabinet decorated with Florentine mosaics. This piece is one of the few pieces remaining from the Medici period and belonged to Ferdinando II de Medici’s wife Vittoria della Rovere (1622 – 1694). The apartments also contain an interesting collection of portraits of the Medici family by Giusto Suttermans, the Flemish painter. This museum is gorgeous. The contrast between the lavishly elaborate rooms in the Palatine Gallery and Royal Apartments makes the simple elegance of the Modern Art Gallery even more noticeable. The newly revamped gallery strikes you immediately as luminous and sophisticated in a minimalistic style. Don’t be confused by the name ‘Modern Art Gallery’ though – there are no Picasso’s or Dali works here. ‘Modern’ is intended as a contrast to Renaissance art and doesn’t refer to 20th century artists. This gallery has mostly works from the 1800’s with some pieces from the early 1900’s. There are a couple of main themes in the museum. One theme is the Italian Macchiaioli painting movement. Macchiaioli painters were similar to the French impressionists (although the Italians preceded the French by about 20 years). The Macchiaioli broke away from academic painting which focused on details and portrayals of historical and mythological figures. Instead, they painted with free brush strokes without any defining lines (in fact, macchia literally means ‘spot’ or ‘blotch’ in Italian) trying to capture the ‘essence’ of the subject rather than a true-to-life reproduction. 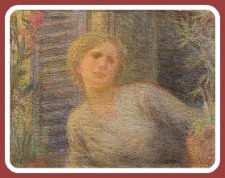 They painted every day scenes and people (left), and even social problems such as one painting showing a death due to a factory accident (Incidente in Fabbrica by Fattori). Like the French impressionists, the Macchiaioli painted outside to show how light played on the subject at different times of day. This led logically to many paintings of nature scenes like forests, lakes, the seaside, and scenery and landscape in general with snow, fog or at dusk or sunrise. This idea of art to represent daily life is found throughout the museum. One is a sculpture called ‘Return from the Post Office’ (Ritorno dalla Posta) by Rivalta Augusto. A 19th century woman is engrossed in reading a letter. This simplest of daily actions is captured in stunning detail. The artist captures the perfect pleats of the woman's petticoat and the dainty details on her fine headpiece, along with an expression of engrossed joy to be getting news from (one can imagine) her husband away in a battle somewhere. Who hasn’t felt this same thrill of finally getting a letter you’ve been waiting for? This piece brings it back to you. Another is a painting in Macchiaioli style by Plinio Nomellini called Primo Compleanno ('First Birthday') . It shows a family happily celebrating a baby’s first birthday. The colors are a variety of blues and turquoises that are remarkably bright and striking – the painting seems to be sparkling. You can really feel how proud the mother is as she holds her child up and the excitement of everyone in the room over this simplest of occasions. Maybe you’ve never heard of these artists before, but, I hope that doesn’t make you think that their work is not worth seeing. The museum is full of beautiful pieces like these. Another theme at the Modern Art Gallery is a look at Italy leading up to the unification of the country in 1861. 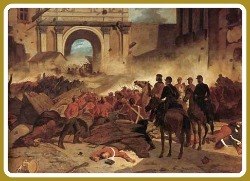 There are paintings of people who fought for the cause, related battle scenes, and views of how the country was affected (below). You also see portraits of the main supporters of Italian unity such as Giuseppe Verdi, Giuseppe Garibaldi, Vittorio Emanuele II, and rulers of the time such as Napoleone (king of Italy in 1805) who was a key figure in the phase between the French revolution and the unification of Italy. The museum also celebrates Florence and Tuscany. There are paintings of the Boboli gardens, Piazza Signoria, the Ponte Vecchio, Fiesole, Florence churches and the countryside such as Massacciucoli lake where Giacomo Puccini lived. You also see portraits of other famous Europeans such as the writer Victor Hugo, the composer Gioacchino Rossini, the poet Lord Byron, and others. If you like simply looking at beautiful art I think you’ll really love the Modern Art Gallery. With the Macchiaioli pieces you get to see a different and lesser known style of Italian painting, and the pieces here overall are easier to appreciate than a lot of Renaissance art that focuses on historical and mythological themes. If, on the other hand, you’re more interested in seeing ‘famous’ classical work by world renowned artists then this museum in the Pitti Palace might not be for you. 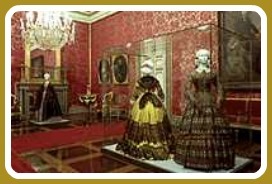 The Costume Gallery in the Pitti Palace was opened in 1983. The name might be a bit misleading because this is really a museum about clothes, fashion and accessories, not ‘costumes’ in the literal sense of the word. The museum shows you how styles evolved and changed from about 1600 to the 1920’s. There are over 6000 pieces but only a selection of these are on display at any one time. The clothing and fabrics are delicate and to avoid damage the exhibit is changed every 2 years. The museum has a couple of period pieces from Medici times, but most of the clothing is from the 1700's and onwards. A lot is also from the 20th century. Some of the presentations provide a nice touch: you see, say, a 17th century outfit, and, alongside it, a contemporary look that uses many of the same features. In this type of display you get a good look at how fashions of the past influence today and how trends are always being recycled, albeit in more modern versions. The museum focuses particularly on Italian fashion. There are pieces from the most prestigious and influential Italian designers: Armani, Cavalli, Fendi, Ferragamo, Ferré, Gherardini, Missoni, Pucci, Valentino, Versace. There are also quite a few French designers such as Yves Saint Laurent, Givenchy, and Jean Paul Gautier. There are plenty of examples of 18th century clothing. You see women’s gowns with tight bodices, puffed out skirts, and flouncy sleeves. Men’s suits include pieces like waistcoats, breeches, and shirts with frills down the front and ruffles at the wrists. The last room has a fun collection of accessories which has the cutest things. Objects such as card purses, letter carriers, tiny sachets to carry matches, a purse-like portable checker set, and stocking-like pouches that are soft and puffy and tied at both ends (like a piece of candy) used to carry things like jewelry. If you’re very interested in fashion and clothes this museum is clearly right up your alley. Tickets to the Costume Gallery are cumulative and include the Boboli Gardens, the Bardini Gardens (nearby), the Silverware Museum and the Porcelain Museum. The Museo degli Argenti, translated literally as the Silver Museum, is also referred to as 'the Medici Treasury', a name which is much more apt. While there is valuable silverware in the museum, that is only a small part of the whole. The museum was set up in 1860 and consists of collections of several kinds of precious objects which once belonged to the Dukes and Princes of Florence and Tuscany. Exhibits include gems, cameos, gold and silver table settings and platters, beakers, silverware pieces, jewelry, ebony pieces, semi-precious stones, drinking horns, vases, liturgical pieces and more. 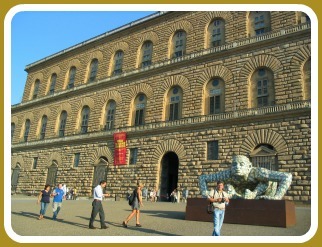 The museum is located on one wing of the Pitti Palace, in what used to be used as the summer apartments of the Duke. One of the most impressive rooms is the grand hall which was richly decorated with frescoes for the wedding of Granduke Ferdinando II de Medici to Vittoria della Rovere in 1635. These lush frescoes pay homage to the past achievements of the Medici family, in particular the life of Lorenzo the Magnificent. Overall, the museum is a vast collection of what is referred to as ‘applied arts’ or ‘decorative arts’, an art form in which every day objects are produced in a highly aesthetic way and are therefore not just common items anymore but are turned into art. 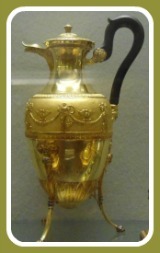 Rather than just a simple pitcher, a pitcher may be cast in a precious metal, etched with elaborate images or adorned with relief work making it into something more than just a water jug (right). 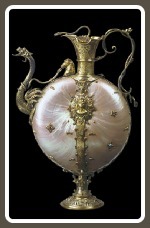 Cosimo de Medici was the first to start collecting objects made of rare or precious materials in the 1400’s. In the museum you can see Cosimo’s rare collection of cameos. The room on the ground floor is dedicated to the collection of Cosimo’s grandson, Lorenzo the Magnificent. Lorenzo’s collection includes a series of ancient vases made with semi-precious stones which are considered among the most important and valuable items in the museum. In this room you can also see an exact image of the face of the great statesman and art patron: this is where the death mask of Lorenzo, cast in 1492 when he died in Florence, is kept. In other rooms you can see pieces considered rare and exotic when they were brought into the Medici court. See objects such as shells made of mother-of-pearl, sea coral, or ostrich eggs brought back from the explorations being carried out across the globe in the 15th and 16th centuries. Such foreign (for the time) curiosity pieces were then re-worked, decorated or used as embellishing in quite creative ways. The mezzanine houses an extensive jewelry collection, starting with the jewels of Anna Maria Luisa de Medici. The selection of jewelry on display also includes many donations from varied sources many of which are also contemporary works. One piece that stands out is a diamond and ameythst tiara by Cartier that is breathtaking (above). Another striking piece of modern gold-work is a ‘blouse’ of lace-work made entirely of gold accompanied by a gold net-like headpiece. The mezzanine is also where you can see a vast collection of miniature portraits, dated between the sixteenth and twentieth centuries. A newer part of the museum exhibits the Medici's collection of porcelain as well as other porcelains donated to the museum which include Japanese and Chinese work and majolica pieces from all over Europe. The Medici Treasury (or Silver Museum) in the Pitti Palace is for people who enjoy seeing rare pieces and collectors items. If you're the kind of person who appreciates all types of craftsmanship and meticulous decorative work, then this museum is for you. To get the most out of your visit however, it might be worthwhile to purchase a guide book at the museum shop as there aren't a lot of descriptions and explanations about the origins or history of the pieces on display. The general prices for tickets to Palazzo Pitti, its museums and the Boboli gardens are written below. However, prices may vary slightly if there is an exhibit on within the museums. A combined ticket is a great bargain (see below) but during some exhibits combined tickets are suspended. Go in free and skip the lines with a Florence Card museum pass! 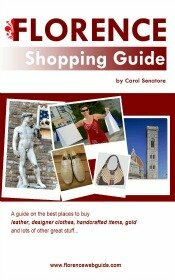 Your best bet is to refer to the website on Florence museums if you want to be 100% sure about prices and ticket information for the days of your trip. €11,50 euros buys you a combined ticket for the whole Pitti-Boboli complex. Why is this the best deal? For just a few euros more than you would pay for a single ticket to the Palatine and Modern Art Gallery, you get to see the Boboli Gardens and any/all of the other museums you may want to visit at Pitti. The fact that a cumulative ticket lasts 3 days makes it a wonderful option since it can get very tiring to try to see everything in one day. The combined ticket gives you the freedom to pop in and out of any Pitti museum you like and – if the weather’s nice – have a stroll or picnic at the Boboli Gardens each day too.